One show, triple bill, with the five-member Bruce Springsteen Band headlining. This was an outdoor show orchestrated by Tinker West's Blah Productions. Garfield Park is located at the intersection of Broadway and Ocean Ave, near the ocean. The line-up for this show is Springsteen, Van Zandt, Sancious, Tallent and Lopez. Bruce handles all the lead vocals. performed as the result of his own shouted request from the audience. In town a day early, Bruce bumps into Phil Hamilton, singer for the Montana-based Lost Highway Band. Due to perform that night at Seattle's Old Timer's Cafe, Hamilton invites Bruce along. That night Springsteen ventures out of the Olympic Hotel alone in the evening, walks a couple of blocks and pays the $1 cover charge to get in and listen to the band. Sat at the end of the bar, Bruce listens to the set before borrowing a guitar and joining the band in a three-song, 15-minute set, although it's not certain that "Gloria" was played. The following night, Springsteen dedicates "The River" to the band. With the Mile High Band, house band of the country-western bar. A newspaper article comments that Bruce arrived at the bar on his motorcycle before jumping on stage. He played for an hour - the band asked him to play "Pink Cadillac", but Bruce couldn't remember the words. 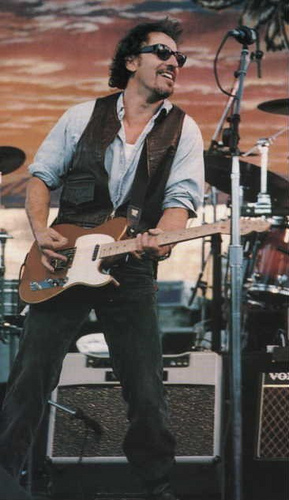 Springsteen apparently told Mile High Band's rhythm guitarist Denny Orr that he was on vacation and on his way to the Grand Canyon. Barmaid Brenda "Bubbles" Pechanec must have made an impression - a week or so later Bruce sent her a cheque for $100,000 (some sources say $160,000) after hearing she was having some trouble with medical bills. Pechanec had just returned to work after undergoing cancer surgery. "(Get Your Kicks on) Route 66" is a popular rhythm and blues standard, composed in 1946 by American songwriter Bobby Troup. The song uses a twelve-bar blues arrangement and the lyrics follow the path of U.S. Route 66 (US 66), which traversed the western two-thirds of the U.S. from Chicago, Illinois, to Los Angeles, California. 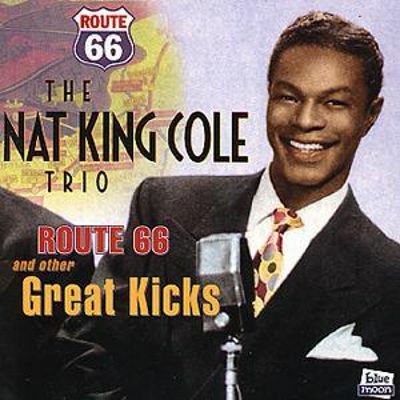 Nat King Cole, with the King Cole Trio, first recorded the song the same year and it became a hit, appearing on Billboard magazine's R&B and pop charts.